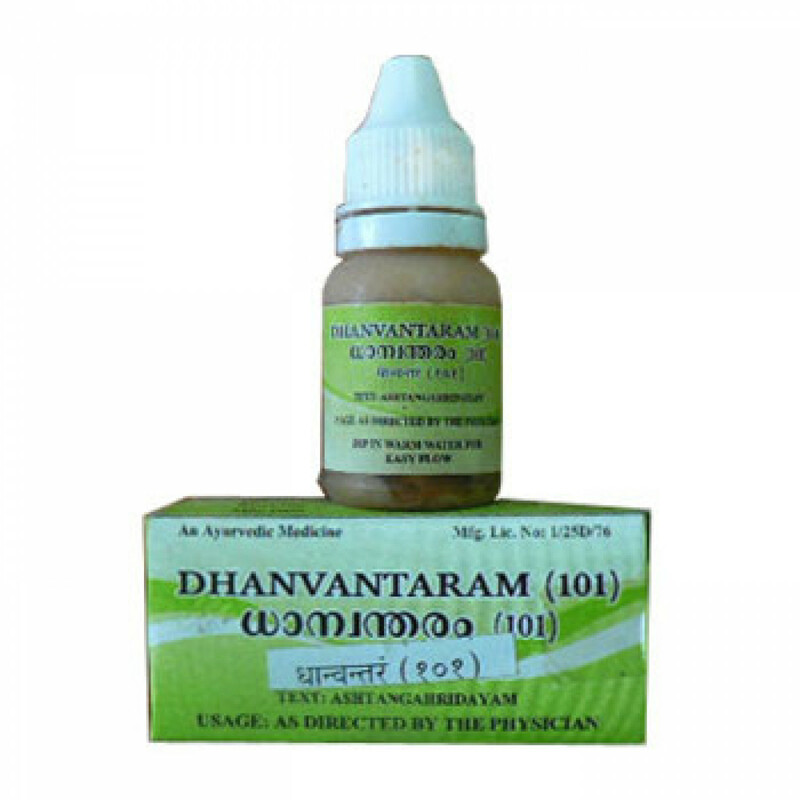 Dhanvantaran tailam 101 is a special oral formula of classical Dhanvantaram tailam. It contains 101 best quality ingredients and it undergoes 101 cycles of processing. Dhanvantaram tailam 101 is one of the best ayurvedic oils with very complex content. It fits all types of constitutions. It is helpful in many rheumatic and neurological diseases, relieves tiredness and muscle tension. Dhanvantaram tailam 101 prevents bone and teeth diseases as well. One of its main advantages is to support woman organism during pregnancy and in the postpartum period. Dhanvantaram tailam 101 is a general rejuvenator and an antioxidant, it boosts immunity. it is helful in neurological, rheumatic diseases, during pregnancy and postpartum period. Indications: joint inflammation, nervous disorders, as a tonic for woman reproductive system. Content: Balamoola, Paya, Yava, Kola, Kulattha, Dashamoola, Bilva, Agnimantha, Shyonaka, Patala, Gambhari, Brihati, Kantakari, Gokshura, Shalaparni, Prishnaparni, Taila, Meda, Daru, Manjishta, Kakoli, Ksheerakakoli, Punarnava, Chandana, Sariva, Kushta, Tagara, Jeevaka, Rishabhaka, Saindhava, Kalanusari, Shaileya, Vacha, Agaru, Ashwagandha, Shatavari, Yashti, Haritaki, Vibhitaki, Amla, Shatahva, Mashaparni, Mudgaparni, Ela, Twak, Patra. Dosage: 5-7 drops twice a day, or as prescribed by physician.